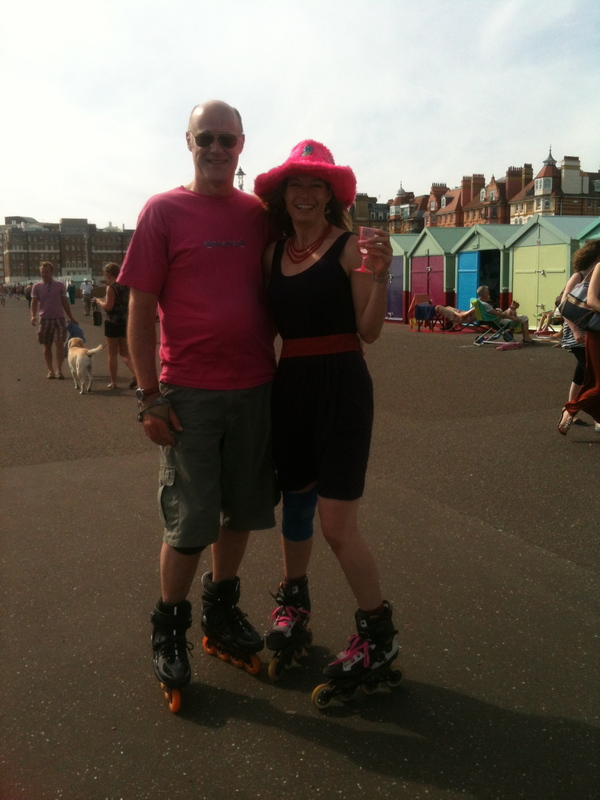 Ever since our first Birthday party on Brighton’s seafront to celebrate our 10 years of skating in pink this social gathering of skaters has become one of our favorite days on the annual skate calendar. Last Saturday proved to be no different. What’s more, we were delighted to find out this day has become a highlight for most skaters. As per usual the sun came out in all it’s glory as if to say happy skating and helping us truly enjoy a day of a sport that is so reliant on good weather. 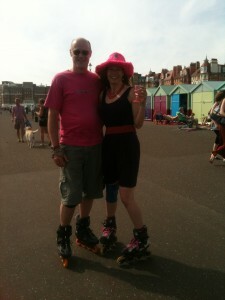 Having seen Skatefresh’s usual skate spot in front of the Westpier taken over by a Segway obstacle course this summer we had to relocate to the beautiful backdrop of the colourful beach huts at Hove Lawn. 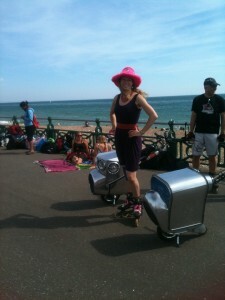 This meant a few skaters skating up and down the beach front in search for the celebrations. But once they joined the numerous skaters slaloming around rubber ducks and Skate Dancing to powerful tunes from the all important skate boom boxes all the searching paid off. There was no head counting, but the number of skaters, friends, curious passer bys and new faces on four wheels once more exceeded expectations. As a skate school it doesn’t happen too often that we just get to hang out and skate for the hell of it, so socialising with the scene, sharing tips and trick and seeing where everyone is at with their skating. A rare joy! As everyone was slalomed up and had shown off a fair bit of SkateDance moves we gathered the group and went on the traditional street skate to the Mariana and back. 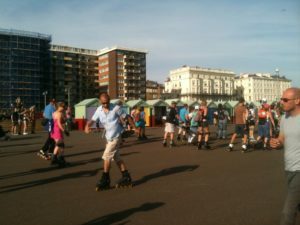 As is the norm we were greeted by cheers and surprise from the hundreds of people who had flocked to Brighton to enjoy the sun but had no doubt not expected a significant group of skaters roll past them on the cycle path. 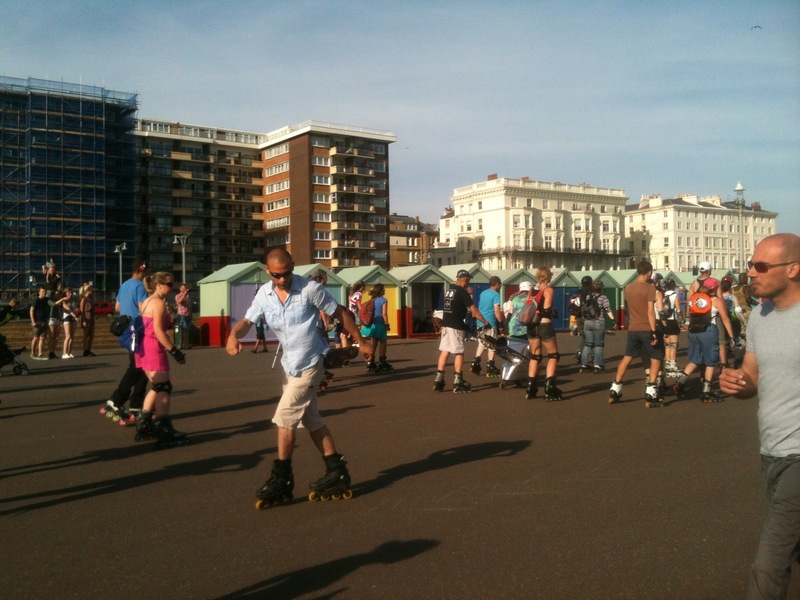 Post street skate most of our wonderful guests just sat with friends old and new and enjoyed a perfect sun set while a few made use of these last hours of daylight to practice backwards skate skills as the seafront hassle and bustle and finally died down. 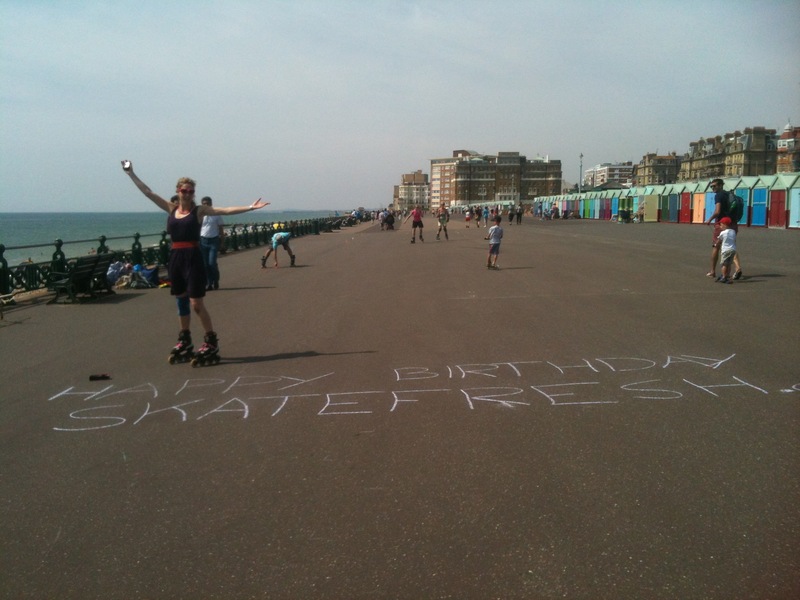 Skatefresh could not have asked for a more perfect day to celebrate yet another fantastic year doing what we love best, passing on the joy of skating and getting such support in return. Can’t wait to see you all again next year for more skating in the sun! 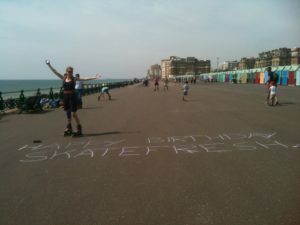 One Response to "Skatefresh Birthday Party 2012"